The garden geranium is a favorite outdoor-indoor plant. It belongs to the genus Pelargonium which means “stork” in Latin. This plant has a long, slender fruit capsule that resembles a stork’s bill. 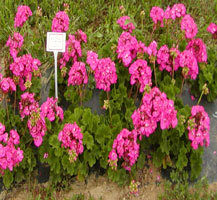 There are over 200 Pelargonium species and many well-known hybrids. Most species originated in South Africa. The common garden geranium is Pelargonium hortorum. Few plants offer such variation in flower color, growth habit, leaf pattern, and scent. Geranium flowers come in white, pink, salmon, red, fuchsia, lavender, and bi-colors. There are double flower types and old-fashioned singles. Growth habits range from trailing vine types to upright garden forms. Leaves may be nearly circular or deeply segmented and lacy. They can be green, green and white, or patterned with combinations of reds, yellows, and oranges. 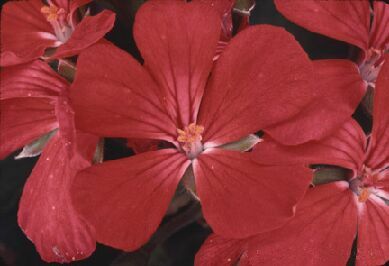 Although the flowers have an unpleasant odor, there are scented-leaf geraniums that are very pleasant. Aromas include lemon, orange, lime, peppermint, pineapple, nutmeg, rose, and many others. Martha or Lady Washington geraniums (Pelargonium domesticum) have the brightest flowers, with colors from purple black to vivid yellow. They do not make good garden plants in Minnesota, however, because they must have cool (50° to 60°F) night temperatures to blossom. This means they will bloom only in early summer and in autumn, not July or August. Though geraniums have traditionally been grown from cuttings in greenhouses, many are now grown from seed that is planted in small “plugs” then grown on before being sold. These hybrid seed geraniums may not be in full flower when you buy them, but they often outperform geraniums grown from cuttings, especially in late summer and early autumn. Seed-grown geraniums are a welcome addition to any sunny garden. Their color range is similar to that of cultivars propagated from cuttings. Elite, Maverick, Multibloom, Orbit, Pinto, and Ringo are just some of the color series of seed geraniums that are available. Wait to plant geraniums outdoors until frost danger has passed and the soil temperature reaches 60°F. Choose a site with lots of sunlight, ideally eight hours or better. With less sun, the plants will bloom sparsely. Soil should be open and porous to allow for good water drainage, oxygen penetration, and healthy root growth. A heavy soil will benefit from the incorporation of several inches of peat, compost, or perlite before planting geraniums. Do not use manure or vermiculite. Sandy soil will also be measurably improved by the addition of organic matter. Geraniums will not bloom well if they are overfertilized. 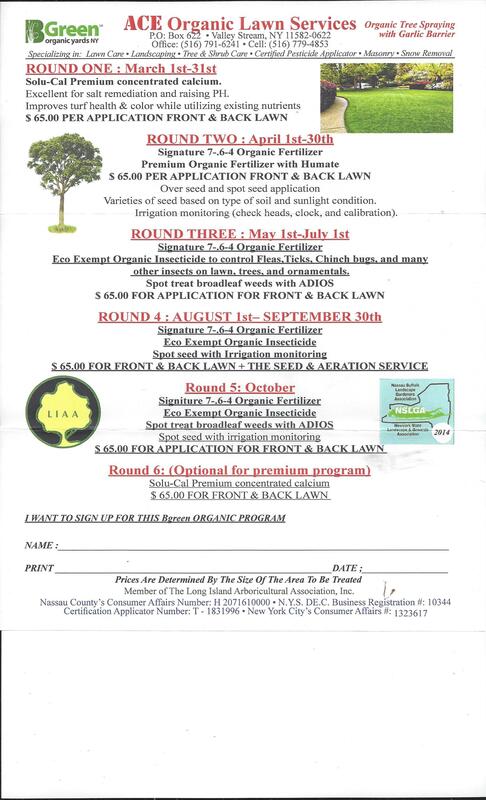 Two pounds of 10-10-10 dry fertilizer or 4 pounds of 5-10-5 dry fertilizer for 100 square feet can be incorporated into the soil at planting. A half-rate application of this dry fertilizer can be spread at mid-season in July. Water these dry fertilizers into the soil. An alternate fertilizer scheme is to use 2 level teaspoons of water-soluble 20-20-20 fertilizer in 1 gallon of water, applied every three weeks. Use either dry or water-soluble fertilizer methods, but don’t use both or you will overfeed the plants. When you plant, make an irrigation furrow or dike around the plants to serve as a reservoir for summer watering. Water geraniums thoroughly, but allow the soil to dry between waterings to avoid root rot. Do not allow the plants to wilt, however. Cycles of wilting, followed by a heavy watering, cause leaf drop and result in poor growth. Remove faded flowers and dry leaves from the plants. These attract Botrytis fungus which attacks leaves and young buds. Protective fungicide sprays may be necessary during periods of cool, moist weather. 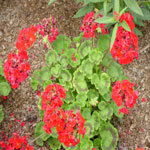 Check your garden center for products labeled for use on geraniums. Fortunately, insects are generally not a problem. Geraniums are attractive in outdoor planters and tubs. The soil in these containers becomes warm from the sun, so it’s important to water regularly. Planters and tubs must have drain holes so moisture won’t be trapped in the bottom, causing roots to rot. Hanging baskets with trailing geraniums are also attractive, provided they are kept in a sunny location, out of damaging wind. If you have a bright location indoors, you can bring your geraniums inside and keep them growing as houseplants until it’s warm enough to put them out the following spring. The practice of storing geraniums in the basement over the winter works better with cold, damp basements than it does with dry, warmer, modern basements. Minnesota has only about 130 frost-free days, and half the summer could go by waiting for poorly overwintered plants to bloom again.